We all know it’s SUPER important to eat a healthy, filling breakfast right? Well, that’s great, but for me, it’s gotta be FAST & also super tasty. Well here ya go! I’m excited to share a new recipe with you that I’ve adjusted from a base recipe and perfected (at least to MY taste! I’ll tell you how to adjust if you have different preferences). I make THESE beautiful protein pancakes in big batches, let them cool, wrap in plastic wrap individually, store in the fridge and hubby and I have SUPER easy, fast, and healthy breakfasts on the go for DAYS. Mix dry ingredients together. Add wet ingredients and stir until mixed. Lightly oil a nonstick pan with coconut oil or olive oil. Warm pan to med-high. Drop 2 tablespoons or so into the pan for each pancake and spread slightly with the back of your spoon so they spread a bit. 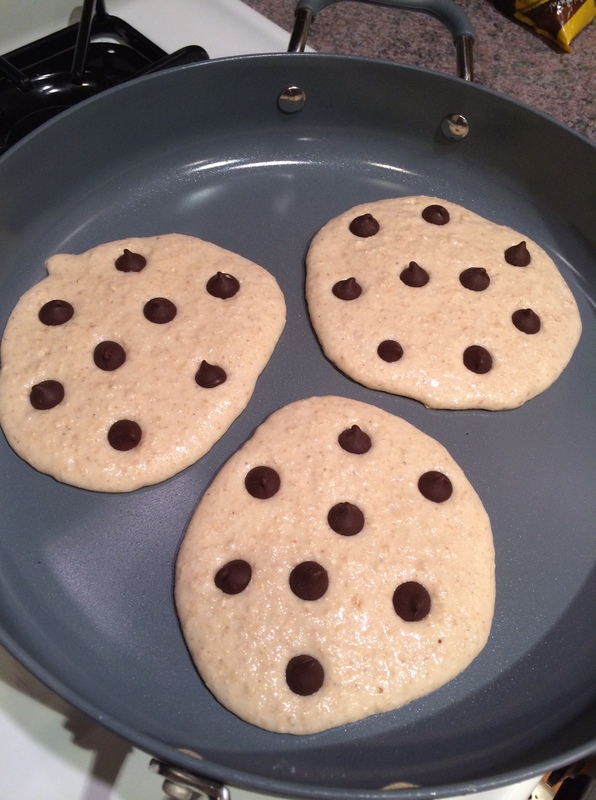 Place a few chocolate chips in into the batter of each pancake while the first side cooks. It takes about a minute to cook the first side. Flip gently and cook the other side for a minute or so until done. Let cool or enjoy immediately. Here’s what they look like when you first put them in the pan & spread the batter a touch. TOP WITH: Pure maple syrup, fresh fruit, whole fruit preserves, or, my favorite, either a tablespoon of peanut butter or a mixture of 1 tablespoon peanut butter whipped with 1 tablespoon plain greek yogurt. You could also play around with all sorts of toppings…maybe a flax/almond butter mixture? Or coconut oil mixed with almond butter? Have fun. And let me know your concoctions. **I said I’d help you adjust if you don’t like the kind of pancakes that I do. If these turn out too thick/dense for you, just cut back the oat flour a touch. If you want more flavor without having to use toppings, add a half a smashed banana into the batter – or a tablespoon of peanut butter. Or play with other extracts. 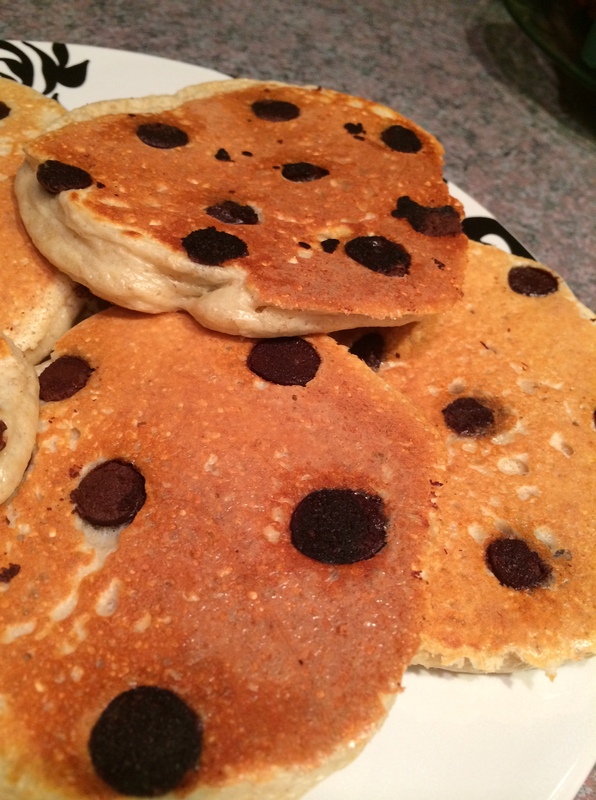 If you like pancakes thinner…you’ll want to spread the batter as you put it in the pan. Since it’s a little thick, it won’t spread on its own like regular pancake batter. I’m always on a search for something I can make me and the hubs that is healthy, easy, and totally packable for lunches. Oh and that I don’t have to prepare nightly. Oh and it has to be filling. And did I mention healthy…? Clean eating can be easy, I promise! Well here you go. This is it. I figured it out and I’ll share it with you. mmmm….doesn’t this look ooey gooey, delicious? It is. Trust me. Cook plain chicken tenderloins until no longer pink. Chop into bite-sized pieces. Cut avocado into small pieces. In a large bowl, smash avocado with a fork and add the chicken, lemon juice, broccoli, and tomatoes. Stir together. Add 1/4 cup greek yogurt and stir. Check the consistency, if you like your food a little less ‘saucy’, this is probably enough for you. If you want it creamier, add a little more greek yogurt. Add salt, pepper, and chipotle pepper to taste. That’s it. Serve in a while wheat pita with a bed of mixed greens. This recipe is very forgiving. You can absolutely add more or less of anything. Replace stuff. Throw in red peppers. Capers. Whatever your heart desires. The more veggies you add, the healthier this becomes AND the more voluminous it is – which will make it stretch even further. I take the mashup and divide it into two large to-go containers…one for my hubby and one for me. 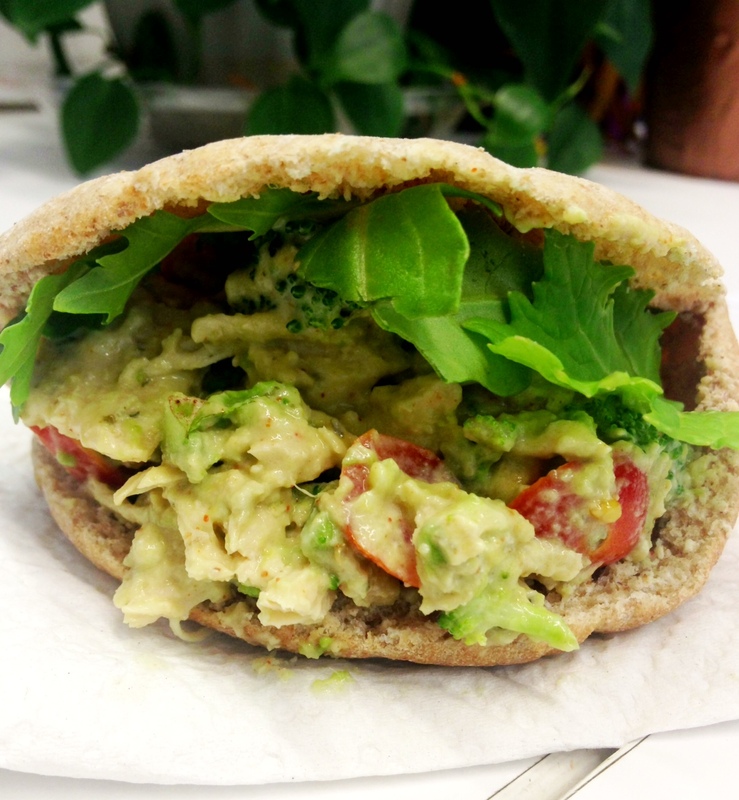 We put it at in the fridge at work & just bring new pitas & mixed greens every day to assemble at lunch time. It usually makes about 4 lunches, so we each have 2 days of lunch covered for very little time and effort. I may just double the recipe next time so we each get 4 days of lunches. We’re not afraid of repetition, especially when it’s THIS delicious and healthy! So there you have it, an easy, healthy, clean eating recipe for your lunches. Or dinners. What do you think? Wondering what to eat to lose weight? Or maybe you want to know what to eat just to be as healthy as you can? It’s no secret, diet is extremely important to weight loss and health and wellness. You can work out every single day, but until your diet is clean, you won’t see the best results possible. Some people will tell you that a calorie is a calorie. If you want to be literal, yes, I suppose it is. If you have a lot of weight to lose, counting and cutting back calories and thinking about little else will definitely help. But there will come a time when you’ll plateau. Not only that, if you’re eating low-calorie junk, you’ll still feel like crap. Not to mention, eating low-calorie junk food will not help your actual HEALTH any. A healthier choice at the SAME calorie count will mean more nutrients, more fiber, more filling, etc. So, put down the 100 calorie snack packs, the pretzels, and the diet ice cream. It’s worth it. You’re worth it. Your results will be SO noticeable, and you’ll feel SO much better once you clean up your diet. But I know you’re still asking… “How do I eat clean?” True, 100% clean would be nothing store-bought, really. Maybe bulk grains and of course produce from the store, but anything in a box would be a no-go. I try to work toward this, but I’m not there yet. Get rid of sodas, inculding diet sodas. Buy organic as much as possible, especially the types of produce and fruit that were directly exposed to pesticides and all that garbage. Berries, greens, apples, etc are especially important. Things that you peel, like oranges and bananas are less important. Combine the ‘must eats’ as much as possible. Try having a big salad for your lunches…include beans, seeds, etc & plenty of veggies, then you get it all in at once! Try to keep meat to only 2 meals a day to start. Try to work your way to 1 meat a day, then if you’re feeling amazing like I think you will be, you can go from there. Get rid of as much packaged food as you can. Check product labels, look for stuff with only real ingredients. If you can’t pronounce it, don’t eat it. Remember to keep your meats lean. Stick to chicken, fish, and turkey as much as possible. Treat yourself some, but be reasonable. Have a drink once in a while if it’s important to you. But be real with yourself about how much you’re eating/drinking, measure it out. Stick to dark chocolate (72% cacao or darker), or red wine..or just a couple cookies a week,etc). This shouldn’t be a daily thing, work to kick your sugar habit. YES you can. Take time every day to relax. No, sleeping doesn’t count. Work on speaking to yourself in a positive voice. Write out your goals. Not just your fitness goals. Write them all out and revisit often. Be nice to yourself and to others, even if they may not deserve it. Soooo….what your FIRST step going to be?? Tell us in the comments below! Do you ever get into a habit that you didn’t even realize you were in? For instance, I have a habit of fixing the same dishes the same way for YEARS. How about you? Like, say, are you in the habit of thinking chili had to stick to certain rules? 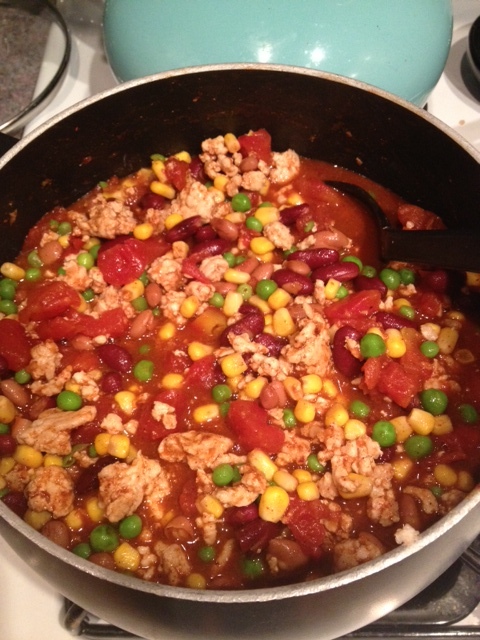 I’ve been thinking…wouldn’t it be great if I made something “like chili, but better”? But that wouldn’t be chili. Right? I’m a rule-follower. So it took me like 3 weeks of thinking this before I finally decided… screw it. I can do what I want to chili and it’s still chili. Well. Let me tell you. I’m glad I did. Because this was extra delicious and extra nutritious. Oh and it lasted us like 3 dinners. Can’t beat that. Look at that…doesn’t it make you want to get a spoon & dip some up through your screen? So I thought I’d share the recipe with you. But, as I just learned…who need recipes?? So please, just make this your own. My point here was to make this super hearty and heart-healthy with LOTS of veggies. You could totally do all sorts of different kinds of veggies. Own it. It’s just chili. This is a very forgiving dish! Heat olive oil over medium heat for a minute or so. Add the turkey and cook through. Do not drain. If you have very lean meat, there will be very little grease, so keep it in for flavor. Add the rest of the ingredients. All of them. Then bring to a boil. Reduce heat and simmer for 30 minutes or so. The longer the better for flavor’s sake. This could also be done in a crockpot. I’d think it would work on low for 6-8 hours. Play with different veggies if you’d like. I think squash would be good in this too. Tell me below, what’s your favorite way to have chili? We’d be eating clean…as clean as possible at least. And we’d cut back carbs to 2 meals a day. We’d eat nothing with added sugar. No beer or wine. And we’d add in extra veggies and fruits. No fast food, very little packaged food – and the packaged food we did eat would be something healthier than most, like Quest Protein Bars (Have you tried these? SO delicious & a TON healthier than other protein bars – which are really more like candy bars. Check the labels!) and Lara Bars. We also decided to log our food for those 2 weeks. That really helps with paying attention to what you’re eating and becoming re-acclimated to what a serving size looks like, and how much our meals SHOULD include. Today is our last day of our challenge. I lost 4 pounds! We’ll be celebrating with some wine and brunch at our favorite spot. (Can Can Brasserie in Carytown…yuuummm!!) But of course we’re very dedicated to continuing this eating plan at about 90% again now that we’re reset. That’s the beauty of doing something like this. Once you give some things up for a while, you crave it less. It’s a lot easier to continue! I wanted to share some of the meals and recipes we had…in case any of you wanted to try your own reset/clean eating challenge. Our meals were quick since we both work full time. And I am a big fan of things that don’t take a bunch of ingredients. So, you’ll find some pretty simple stuff here…. I’d love to know what you guys think. Do these looks like meals you’d eat?? Again, we ate this or a variation of this many mornings. It’s super quick, easy, filling and tasty. Oh and healthy. Just scramble the egg and cook with the spinach. Add salt and pepper if you’d like. Spread the hummus on the toast and top with the egg scramble. Add sriracha to taste. Some variations I like to use: add chopped tomato to the scramble and/or 1/2 of a avocado. You could also skip the toast. Also a very forgiving recipe to replace or add other veggies you may like! Just warm the sesame oil over medium-high heat for a minute. Add the veggies and cooked chicken. Add the rest of the sauces, spices, and peanut butter. Stir constantly for a few minutes until sauces and peanut butter are fully mixed in and warm all the way through. Seriously. You’re done. And you could add more or less veggies as you’d like, but we added a lot since there’s no noodles or rice in this stirfry. This was SO delish! (And quinoa.) Oh Em Gee….!!! So good! Prepare quinoa according to package. Warm sausages on the stovetop over medium heat for about 8 minutes. 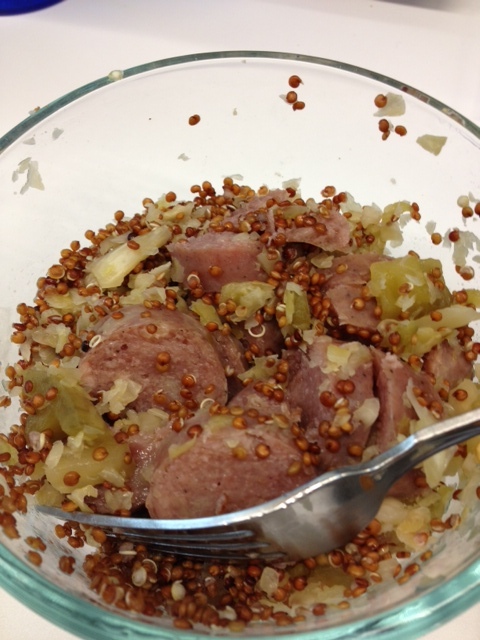 Add sauerkraut and prepared quinoa to the pan with sausages and warm for a couple more minutes. 1 serving is 1 link plus a scoop of sauerkraut and quinoa. This made wonderful leftovers for work the next day, too! Okay, that’s some of what we used….and all were very satisfying and filling, and super tasty. I’ll save the rest for another post so this one doesn’t get too cumbersome. Comment below if you’d like me to send you the rest sooner, though! So you already know you GOTTA eat breakfast right? But you also know it should be healthy. And for most of us, it has to be quick and easy. Oatmeal is a quick, healthy option. That does get old though, and I don’t even like it at all. Most cereals are junk. Breakfast bars are junk. So what does that leave? Here’s a little something I whip up at the office in the AM. It takes about 5 minutes total, and I only use the microwave. Here’s what it is and how I do it. There’s plenty of ways to change it up, too. 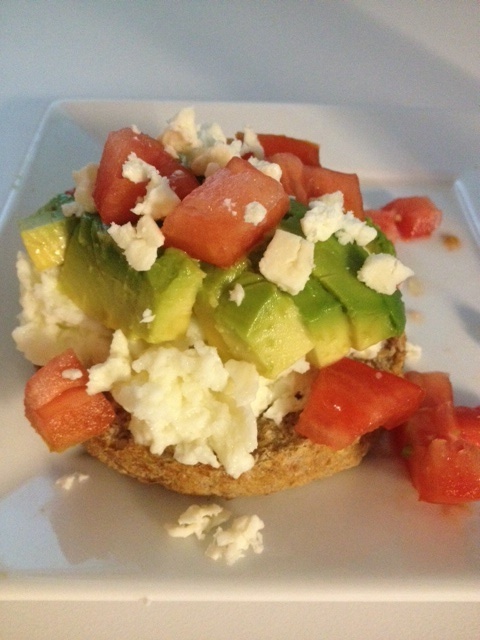 It’s a half of a sprouted grain english muffin w/ egg whites, avocado, tomato and feta cheese. And some days if I have it, I spread a little greek yogurt on the english muffin too. I keep a carton of natural egg whites in the fridge (NOT the kind w/ yellow color added. Look in the natural, organic section of your grocery store. They should just be white! Wrap an ezekiel english muffin in a paper towel and microwave for just about 20 seconds. Just enough so you can cut the muffin in half since you’re only using half. Cut it, put 1/2 back in the freezer and then finish microwaving the 1/2 you’re using. Doesn’t need to be hot, just defrosted. Chop up half the avocado, store the rest in the fridge for a salad later in the day or something. Put the egg whites on the muffin, top with tomato, avocado & feta. It’ll be messy since it’s open-faced. Just use a fork and knife to eat it. BOOM. You just made a healthy, protein packed breakfast that has some lovely, filling, healthy fats and even a little tomato. You could adjust this in all sorts of ways, too. You could top with some fresh spinach, add the greek yogurt like I mentioned. You could even microwave a slice of turkey bacon and add it. 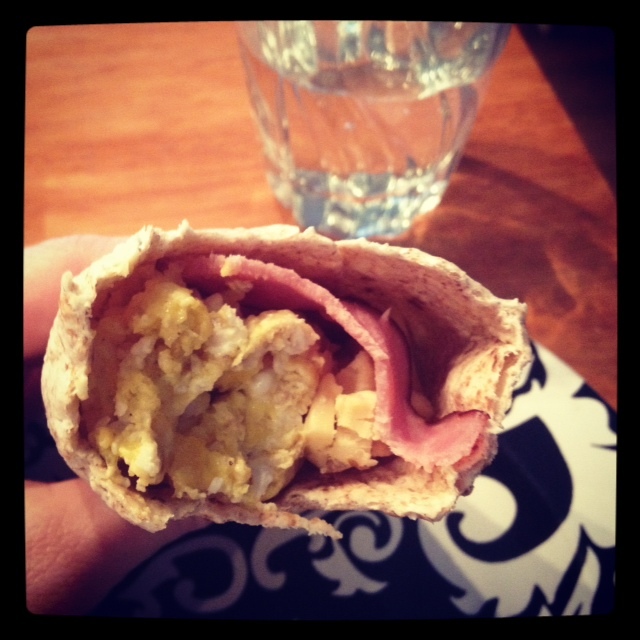 If you’re not an english muffin fan, check out the ezekiel wraps. Use half. And definitely use sprouted grain breads, they are SO much better for you than even whole wheat bread. I’d love to know – do you have a quick, healthy breakfast that is your go-to? Share away! 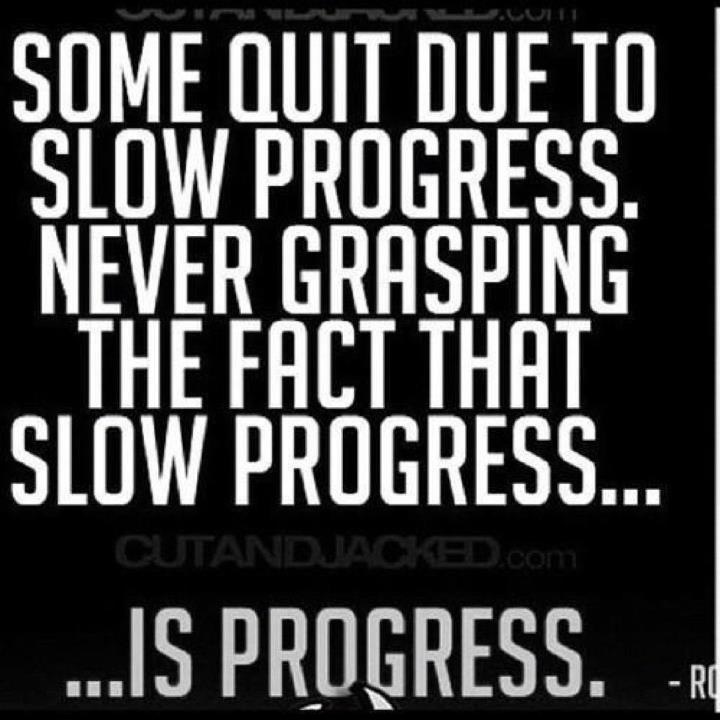 Slow progress is still PROGRESS! Just because you haven’t reached your goal fast enough…or even if you’re not seeing progress like you think you should….ANY progress is still progress. We didn’t get out of shape overnight. We won’t get in shape overnight. And some changes are hard to stick with. The key is finding those changes you CAN make and that are sustainable and go from there. Keep pushing! You haven’t failed until you give up. What timeframe do you give yourself for your weight loss or fitness goals? Have you ever considered setting a 5lb a month goal? Or 1/2 inch a month? Something else? Have you messed up your diet? I admit, there’s more days than I’d like to admit where I feel like I failed at my ‘healthy eating’. (I try not to call it a diet.) I’m still susceptible to eating JUNK when I’m stressed or if I get too hungry and haven’t planned well. I know I”m not alone. I get emails and messages about it all the time. It’s tempting to give up after having a rough go at mealtime for a few days…or weeks. 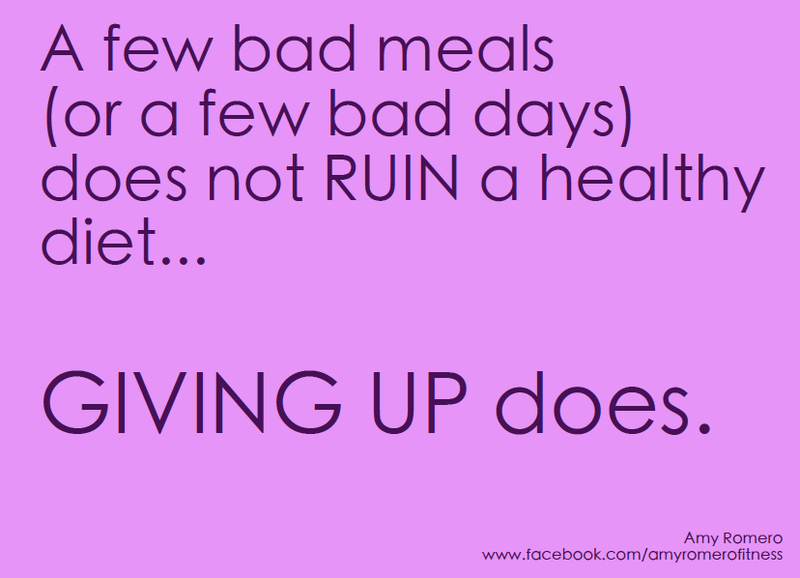 But I have to remind myself – and I’m reminding you, that a few bad meals or a few bad days or weeks…does not mean you should give up. It does NOT negate all the hard work you’ve been through. Actually the same goes for missing workouts. Maybe you worked out religiously for 2 weeks but then you just sort of lost interest and haven’t done anymore for 2 weeks. You haven’t failed! Those 2 weeks you did complete are still with you. Just get back to it and be kind to yourself. The most important thing is to get your mind back in the game and just START again. I created the poster below based on what I tell myself and what I try to pass along to you guys. Feel free to share on Pinterest, Facebook, or wherever you’d like. I think we all need to be reminded of it now and again. Have you ever given up on a fitness program or a diet because you felt like you’d failed after having some bad days/weeks? If you’ve seen the commercials for some of these products, you may believe that they are healthy. Not true. 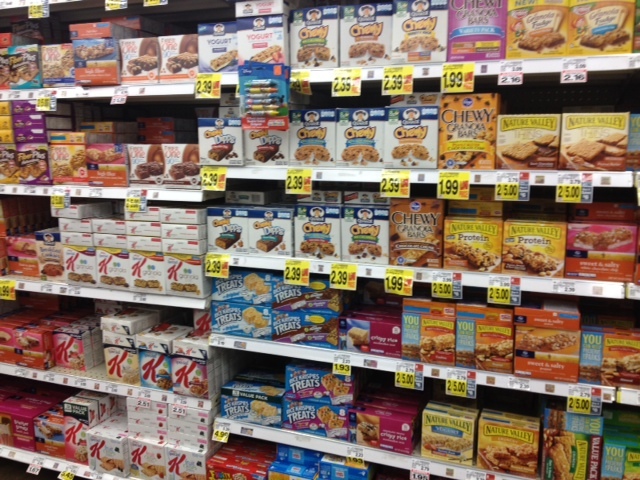 Most of these types of products are marketed as ‘filling’ or ‘healthy’ in some way. But in reality, many have as much sugar as a candy bar. Not to mention all of the other random crap in them. They are devoid of many nutrients. This goes for a LOT more than what I captured in this photo the other day while I was grocery shopping. I’d love to know, do you buy any of the items in the photo? If so, do you buy them because you thought they were healthy – or at least not ‘unhealthy’? Lots of times when people ask me for help losing weight or getting in shape, a hang up ends up being about food. Sometimes folks think they should eat very little. Or perhaps they just don’t feel like they have time to cook or prepare anything. And even a few just don’t know what to eat because they’re confused about all of the conflicting information out there. Well I’m here to tell you a few things about that. a) No, you should not cut your calories to 1200 or less. There’s a formula based on height/weight/age/activity level that can help you figure out how much you should be eating. And no. It’s not 1200. People get that in their heads because they hear people say “you should never eat less than 1200”. That’s true. That’s the bare minimum to fuel your body for NO activity. But trust, me 1200 is waaaaay too low. You may lose weight this way, but you’re losing muscle and water weight. If you eat too little, you are slowing your metabolism down. Not cool! We all want faster metabolisms, don’t we? You must eat, eat, eat to get that. (Eating healthy foods, of course, not junk!) I literally eat something every 2-3 hours. My body is a fuel/fat burning machine, partially due to my food intake, and partially due to my muscle-building workouts, of course. b) Yes, you have time to prepare healthy stuff. Here’s what I make for most mornings. I make a bunch on the weekend and freeze them. They take 2 minutes to heat up in the morning, and it’s homemade so you know there’s no added crap in it. There’s plenty of protein and even some whole grains so you’ll feel fuller longer and you’ll fuel your body the right way. Just scramble some eggs with salt and pepper, spoon the equivalent of about 2 eggs onto a whole grain (or low carb) tortilla – the small, taco sized tortiallas. Add a slice or two of canadian bacon – or turkey bacon if you prefer. Optional, top w/ a tablespoon of salsa and or a little bit of low fat cheese. Roll your tortilla with both ends tucked in and wrap tightly in plastic wrap. Freeze. To serve, take plastic wrap off and microwave for about 2 minutes, depending on your microwave power. It takes only about 10 minutes to cook, assemble and throw 6-8 of these in the freezer. Here’s a freshly made one that I made over the weekend. I added a little gouda to this and it was absolutely heavenly and I was actually full for a few hours, YAY! c) I know there’s lots of confusing information out there. And I’m happy to answer your questions, so please always feel free to comment here or even email me: fithappy@yahoo.com and I’ll help you sort through the confusion. But a couple of rules I’ve found to live by… don’t get caught up in any fad diets, they will work short term, but are typically too radical to follow for very long. Not to mention many times they cut out entire food groups. Not a very sustainable way to eat. Don’t be afraid of things like carbs. Switch to whole grain pastas and breads and your carbs won’t be as evil…and do try to go carb-free for one meal a day or so. We all need carbs if we’re active at all! And finally, don’t be afraid of fat. Fat doesn’t make you fat. Sugar does. Kick that sweet tooth habit if you have it. And yes, carbs do turn to sugars, so that’s why you should go carb-free once a day and why you should switch to whole grains. Really, don’t get too caught up in these things. Eat whole foods, fresh fruit and vegetables, limit your boxed/canned/processed foods and pay attention to eating something every few hours. That, combined with exercise is the key to a healthier lifestyle! So tell me, what’s the most confusing thing about food for you? You are currently browsing the archives for the food choices category.